This item is five rolls of 120-format roll film. Box Dimensions (LxWxH) 5.35 x 2.95 x 1.0"
Professional Tri-X 400 Black and White Negative Film (120 Roll Film, 5-Pack) is rated 4.8 out of 5 by 237. Rated 5 out of 5 by St. Louis Michael from True American film As a photojournalist I used a lot of Tri-X. It (was) is my go-to film. If I didn't know what I was going to run into this is the film I would use. I tried Ilford and got acceptable results, but the look wasen't there...look at an American newspaper from the 1980 then look at an English paper from the same time. The photos in the US paper were usually Tri-X and the English was usually Ilford. Look for the difference in shadow detail and how the highlights look...this is the Look (if you can't see any difference then either film will work for you. )I still use Tri-X, in 120, for fine art imaging - scanned negatives and inkjet printing...but I do miss the darkroom.PS: It isn't ISO 400 - its 200! But, that's Kodak Marketing. Rated 5 out of 5 by Anonymous from what can be said about Tri-X? I will limit my review on Tri-X to information that will be useful to a photographer that develops their own film. Pros: Tri-X has been around for so long it evolved into the industry standard for what a 400 speed film should deliver. It is tried and true; great tonal range, consistent, and dependable. Cons: It has a stubborn magenta stain and is prone to very pronouced curling. Despite the two cons listed above I am still giving this film 5 stars. The reason is because the film's ability to capture an image is independent, and not compromised, by these two problems; magenta stains eventually come out with patience and a stack of books flattens any curl with enough time. Rated 5 out of 5 by Darkroom User from By far, the BEST black and white film! Kodak Tri-X is by far THE BEST black and white film. 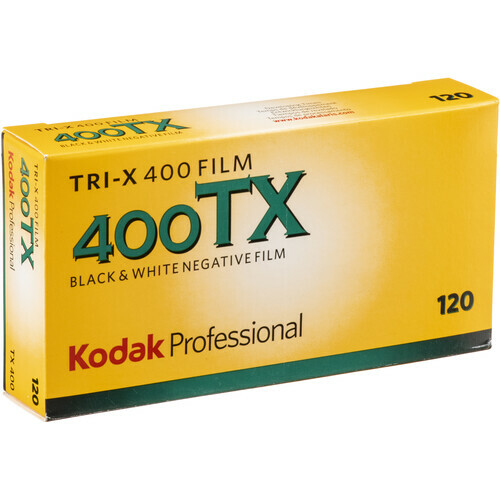 We as photographers are so fortunate that it is still available from Kodak- and still at an affordable price. Long live Tri-X, shoot it while we still can! This film far out performs the rest in nearly every situation and holds well to push processing. It has a classic black and white look and tones that simply cannot be found anywhere else. Tri-X in D-76 developer is a timeless combination that I can simply never find enough of. A true classic. Rated 5 out of 5 by Mark Booth from Outstanding Fine Art Applications I have used Kodak Tri-X Pan film in perhaps well over a thousand development sessions and print on a regular basis. Tri-X responds extremely well to development in tanning and staining developers, such as PMK formula. It is equally at home with standard developers or for push processing for speed increase. I love the tonal range and graphic quality of this film, for it truly displays the character I am after. If developed carefully, one can easily control grain with a fine grain developer, or choose to work with an acutance developer, like Rodinal, of FX-2, to bring out that gritty and edgy feel in which it is famous. For those using Tri-X or TXP for alternative processes, it works exemplary with tanning and staining developer formulas. Rated 5 out of 5 by MiamiMathGirl from Great classic look TriX has been a favorite amongs photographers for years, and I can definitely see why. The grain is very nice, and it delivers a beautiful contrasty black and white image. I'm a big fan of quality grain in film, and I can usually spot TriX grain from a mile away. This film's got character, and I absolutely love it. The tonal range is also outstanding on this film. It reproduces and scans very well also. I normally shoot this film at ISO 400, but have pushed it to 1600 with decent results. It's got great latitutde. It's my go-to standard for B&W work, and looks to remain so for many many years to come. Rated 5 out of 5 by Cris from Very Nice Film, but Difficult to Spool on 620 I really enjoyed using this film. I was a little unsure if it was worth the extra money as opposed to the Holga 120 film, but it was. I have been using this with my Hawkeye Brownie and respooling on a 620 spool. This film makes beautiful pictures and negatives. My only complaint with this film is the fact that it has been difficult to start on the spool every time. I usually have to try winding and then take the camera apart and pull the leader to get it to start properly. During this process I always feel very close to the exposures, but it has not caused a problem yet. Overall a very good film and well worth the price and difficulty spooling. Rated 5 out of 5 by Murray from For my esthetic and sensibilities, this is simply the best! I have been using Kodak Tri-X since I started making photos with any serious intent in 1977. I have tried others over the years, from super fine grain slow films, to other manufacturers 400 film, to the latest greatest, t-grain films that came along and the path always leads me back to Tri-x. A beautiful look, grain, but not objectionable, esp. in medium format of larger. It has a distinctive and beautiful look. And has a great altitude, which is handy when photographing on the run w/o time to make an exposure reading but knowing the film so well, my guess is close enough. Best film ever and still! Can this film be used with a 35mm camera? Reviews of this product indicate that the actual ISO is 200, not 400? At what ISO should this ISO be shot? This roll is 24 or 36 exposures? Thank you!! Hello, does it work with the Canon Ae-1 Program camera? This is not the right film for that camera, you need 35mm film.. There is kodak tri-x 35mm but it is sold 1 roll at a time. This film is 120 film which is larger but with less exposures...Great film, just wrong size for your camera. hi, do you have the fresh ones or all are expired in 2011? Answered by: Guillaume Ki Ho T.
Does anyone know the expiration date of this film. The answer to a similar question was submerged in muddy water. 2011? The film is good on my roll I believe until April of 2020, of course I got my film about 6 months ago, so I&rsquo;m not sure if I can give a longevity answer. can this film be used in a brownie camera? I've used it on a Hawkeye. You need to take 120 film and re-spool it in the dark on a 620 spool. It's really not hard, just take your time and you will be able to do it and then use it. It's alot of fun. How many exposures does this roll (for 120 medium format version) come with?